Even in the marginal conditions, Oracle Team USA look smooth and fast. Well, somehow they did it: America’s Cup Race Management managed to pull off all four scheduled races on Thursday, despite light winds that rarely climbed much above the 6-knot minimum as stipulated by race rules. It wasn’t pretty, hardly the adrenaline-soaked foil fest race the fans want. But given that not a single race could be run on Wednesday, they really didn’t have much of a choice—a TV schedule is a TV schedule. One thing is for sure: Artemis sure was lucky to not have to get out and race in that mess. The other teams, not so much. That said, despite the extreme (light) conditions, the final results were very much in keeping with what we’ve been since the beginning of the regatta, with Oracle Team USA and Emirates Team New Zealand both looking smooth, fast and strong—not just winning their races by wide margins, but coming from behind in both cases to do so. Throughout the day they also both did a much better job of staying on their foils than the rest of the competition. As for the rest of the teams: Softbank Team Japan had moments where it looked good, but then folded against Oracle Team USA; Britain’s Land Rover BAR seemed sketchy at best, losing badly to the Kiwis (withdrawing from before the finish, no less!) after dropping off its foils early and then just falling farther and farther behind; and much as we’ll miss Franck Cammas’s winning smile, the chances of Groupama Team France making it through to the next round now seem slim to none. Again, the racing couldn’t have been much uglier, with the teams desperately trying to stay up on their foils during gybes and tacks, not to mention spending plenty of time in displacement mode, with one and sometimes both two hulls securely planted in the water. Throughout the day, all the teams could be seen shifting their crew weight forward, aft, port and starboard—all in a desperate effort to just keep their boats moving. Despite posting a win against the French, Land Rover BAR seemed to get the worst of it all-around in terms of pressure—or maybe it just looked like it had to work the hardest trying to keep foiling. At one point, helmsman Sir Ben Ainslie literally threw up his hands mid-tack en-route to the team’s loss to ETNZ, so frustrated had he become trying to get his boat moving again. During the team’s win against Groupama, both crews spent much of the time trying to coax their boatspeeds above single digits. Racing resumes this afternoon, with the Round Robin 2 Qualifying series concluding on Saturday. 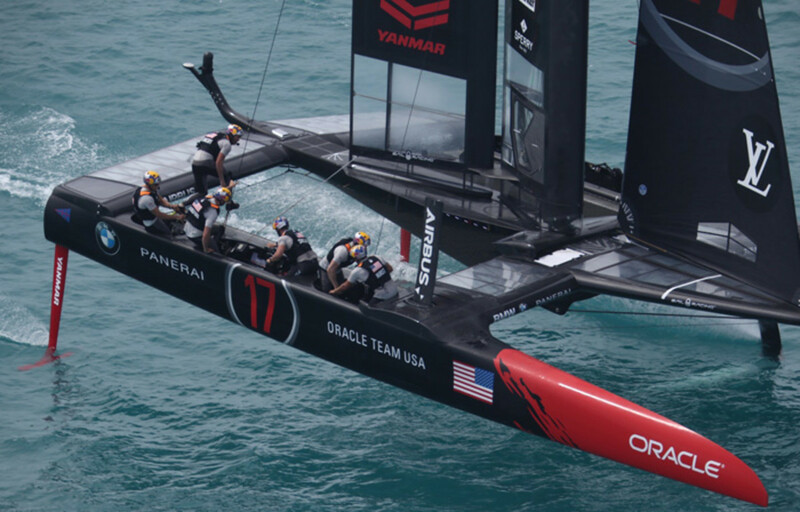 After that, the event moves on to the “Challenger Playoffs” to see which team will ultimately match up against the Defender Oracle Team USA in the actual America’s Cup regatta. Only four of the six boats will take part in these playoffs, with the lowest-scoring challenger and the Defender both dropping out. At this point ETNZ and Land Rover BAR are already guaranteed of moving on, while Japan, Artemis and Groupama Team France are still fighting for the final two. The America’s Cup match itself is slated to start June 17. For complete results, visit: https://www.americascup.com/en/results.html.